Three days after launching an all new tvOS App Store alongside the fourth-generation Apple TV, Apple on Monday added a Top Charts section to aggregate the online shop's most popular and highest grossing titles, revealing games to be high on users' download lists. Tacked on to the tvOS App Store as a browsing alternative to Featured, Purchased and Search, the new Top Charts category highlights top paid apps, top free apps and top grossing apps, as calculated since last week's launch. The system is identical to app rankings applied to the iOS or Mac App Stores. It appears early Apple TV adopters are willing to pay a premium to test out the set-top box's ability to run games, as the category is currently dominating both Top Paid Apps and Top Grossing Apps. Gaming titles like Beat Sports and Galaxy on Fire account for eight of the top ten apps on both charts. At $9.99, Beat Sports, which was demoed at Apple's iPhone event in September, sits in the number one spot. Rayman Adventures and Crossy Road sit atop Apple TV's free apps chart, though users are showing an initial interest in streaming content services from established broadcasters like Fox and CBS. App services from cable channels including HBO and Showtime are counted among the top free apps despite requiring paid subscriptions. 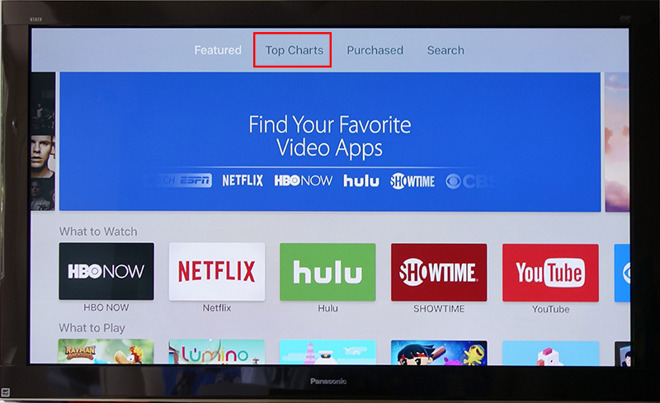 It is unclear how many users end up activating paying accounts, or signing up for trial sessions, but these streaming titles are currently among the most downloaded on tvOS. Owners of the fourth-generation Apple TV can find the Top Charts section in the App Store's top navigation bar next to Featured, Purchased and Search. If the category is not showing up, force quit App Store in the tvOS app switcher and reopen.